This Eggplant Beef Bake is from Holly Clegg's Trim & Terrific Gulf Coast Favorites: Over 250 easy recipes from my Louisiana Kitchen. 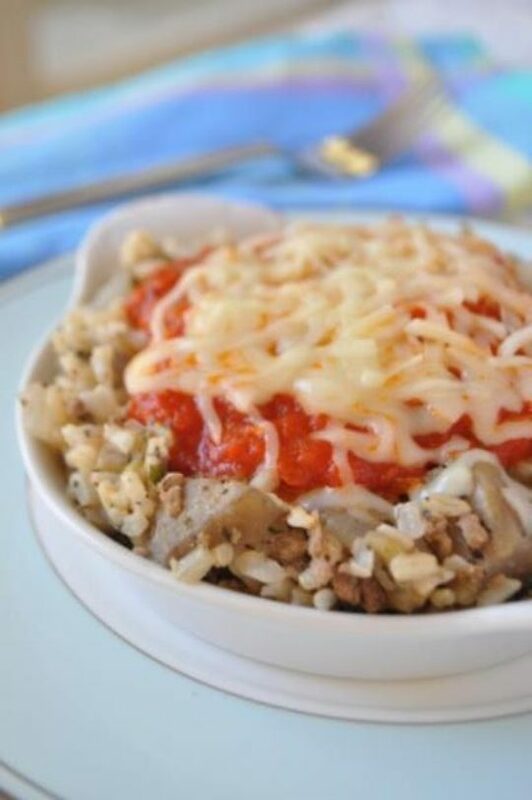 Plentiful amounts of eggplant, beef, marinara and cheese give you an instant, one-dish casserole great for everyday meals. In a large nonstick skillet coated with nonstick cooking spray, sauté eggplant, onion, garlic, and meat until meat is done and eggplant is tender, about 20 minutes. Add oregano, basil, and rice. Season to taste and mix well. Transfer to a 2-quart casserole dish. Cover with marinara sauce and sprinkle with cheese. Bake for 20–30 minutes or until thoroughly heated.